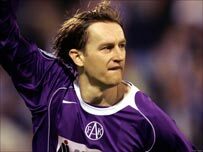 Rangers have signed 26-year-old defender Sasa Papac from Austria Vienna for £450,000. Papac had travelled from Malta, where he was with the Bosnia-Herzegovina squad, to Glasgow to complete a three-year deal late on Thursday. He said: "It has been a crazy day, but I was determined to join Rangers. "I arrived in Malta with the national team and then got on a private jet to come to Scotland and now I have to go back again. It's all been worth it." Papac becomes the third capture by Rangers from the Austrian club this summer. Ibrox manager Paul Le Guen had already raided the Austrians for midfielder Libor Sionko and striker Filip Sebo. "It is fantastic for me to join a great club like this and, of course, I will be getting back together with Libor Sionko and Filip Sebo," said Papac. "I have been in touch with them all the time about the move. "I spoke to Filip twice today and everything he said about Rangers was good. It was the same with Libor. "The three of us won the double in Austria last season and it is my dream that we can win the championship and cup with Rangers." It appears that funds were released after Rangers negotiated the release of four defenders. Bob Malcom, Marvin Andrews, Olivier Bernard and Jose-Karl Pierre-Fanfan all left the Glasgow club on Thursday. Le Guen said: "One defender was be enough to complete our squad because I think we have a good group of players here now. "We are well stocked in the attacking areas, but it is a long season and I feel that we needed one more defender to round off the group. "Sasa is a player I have been aware of for some time and he gives us more options in defence." Rangers chief executive Martin Bain added: "We have to thank national team coach Blaz Sliskovic for allowing Sasa to come to Scotland to complete the deal."